i have two bits of news, one from this October 2017 about using light to control a memristor’s learning properties and one from December 2017 about memristors and neural networks. Memristors – or resistive memory – are nanoelectronic devices that are very promising components for next generation memory and computing devices. They are two-terminal electric elements similar to a conventional resistor – however, the electric resistance in a memristor is dependent on the charge passing through it; which means that its conductance can be precisely modulated by charge or flux through it. Its special property is that its resistance can be programmed (resistor function) and subsequently remains stored (memory function). In this sense, a memristor is similar to a synapse in the human brain because it exhibits the same switching characteristics, i.e. it is able, with a high level of plasticity, to modify the efficiency of signal transfer between neurons under the influence of the transfer itself. That’s why researchers are hopeful to use memristors for the fabrication of electronic synapses for neuromorphic (i.e. brain-like) computing that mimics some of the aspects of learning and computation in human brains. Human brains may be slow at pure number crunching but they are excellent at handling fast dynamic sensory information such as image and voice recognition. Walking is something that we take for granted but this is quite challenging for robots, especially over uneven terrain. In their new paper in Nanoscale (“Reversible Optical Switching Memristors with Tunable STDP Synaptic Plasticity: A Route to Hierarchical Control in Artificial Intelligent Systems”), Kemp and his team demonstrate the ability to reversibly control the learning properties of memristors via optical means. The reversibility is achieved by changing the polarization of light. The researchers have used this effect to demonstrate tuneable learning in a memristor. One way this is achieved is through something called Spike Timing Dependent Plasticity (STDP), which is an effect known to occur in human brains and is linked with sensory perception, spatial reasoning, language and conscious thought in the neocortex. STDP learning is based upon differences in the arrival time of signals from two adjacent neurons. The University of Hull team has shown that they can modulate the synaptic plasticity via optical means which enables the devices to have tuneable learning. According to the team, there are many potential applications, such as adaptive electronic circuits controllable via light, or in more complex systems, such as neuromorphic computing, the development of optically reconfigurable neural networks. Having optically controllable memristors can also facilitate the implementation of hierarchical control in larger artificial-brain like systems, whereby some of the key processes that are carried out by biological molecules in human brains can be emulated in solid-state devices through patterning with light. Some of these processes include synaptic pruning, conversion of short term memory to long term memory, erasing of certain memories that are no longer needed or changing the sensitivity of synapses to be more adept at learning new information. “The ability to control this dynamically, both spatially and temporally, is particularly interesting since it would allow neural networks to be reconfigurable on the fly through either spatial patterning or by adjusting the intensity of the light source,” notes Kemp. In their new paper in Nanoscale Currently, the devices are more suited to neuromorphic computing applications, which do not need to be as fast. Optical control of memristors opens the route to dynamically tuneable and reprogrammable synaptic circuits as well the ability (via optical patterning) to have hierarchical control in larger and more complex artificial intelligent systems. A new type of neural network made with memristors can dramatically improve the efficiency of teaching machines to think like humans. The network, called a reservoir computing system, could predict words before they are said during conversation, and help predict future outcomes based on the present. The research team that created the reservoir computing system, led by Wei Lu, professor of electrical engineering and computer science at the University of Michigan, recently published their work in Nature Communications. Reservoir computing systems, which improve on a typical neural network’s capacity and reduce the required training time, have been created in the past with larger optical components. However, the U-M group created their system using memristors, which require less space and can be integrated more easily into existing silicon-based electronics. Memristors are a special type of resistive device that can both perform logic and store data. This contrasts with typical computer systems, where processors perform logic separate from memory modules. In this study, Lu’s team used a special memristor that memorizes events only in the near history. Inspired by brains, neural networks are composed of neurons, or nodes, and synapses, the connections between nodes. To train a neural network for a task, a neural network takes in a large set of questions and the answers to those questions. In this process of what’s called supervised learning, the connections between nodes are weighted more heavily or lightly to minimize the amount of error in achieving the correct answer. Once trained, a neural network can then be tested without knowing the answer. For example, a system can process a new photo and correctly identify a human face, because it has learned the features of human faces from other photos in its training set. Image recognition is also a relatively simple problem, as it doesn’t require any information apart from a static image. More complex tasks, such as speech recognition, can depend highly on context and require neural networks to have knowledge of what has just occurred, or what has just been said. “When transcribing speech to text or translating languages, a word’s meaning and even pronunciation will differ depending on the previous syllables,” says Lu. This requires a recurrent neural network, which incorporates loops within the network that give the network a memory effect. However, training these recurrent neural networks is especially expensive, Lu says. Reservoir computing systems built with memristors, however, can skip most of the expensive training process and still provide the network the capability to remember. This is because the most critical component of the system – the reservoir – does not require training. When a set of data is inputted into the reservoir, the reservoir identifies important time-related features of the data, and hands it off in a simpler format to a second network. This second network then only needs training like simpler neural networks, changing weights of the features and outputs that the first network passed on until it achieves an acceptable level of error. IMAGE: Schematic of a reservoir computing system, showing the reservoir with internal dynamics and the simpler output. Only the simpler output needs to be trained, allowing for quicker and lower-cost training. Courtesy Wei Lu. “The beauty of reservoir computing is that while we design it, we don’t have to train it,” says Lu. The team proved the reservoir computing concept using a test of handwriting recognition, a common benchmark among neural networks. Numerals were broken up into rows of pixels, and fed into the computer with voltages like Morse code, with zero volts for a dark pixel and a little over one volt for a white pixel. Using only 88 memristors as nodes to identify handwritten versions of numerals, compared to a conventional network that would require thousands of nodes for the task, the reservoir achieved 91% accuracy. Reservoir computing systems are especially adept at handling data that varies with time, like a stream of data or words, or a function depending on past results. To demonstrate this, the team tested a complex function that depended on multiple past results, which is common in engineering fields. The reservoir computing system was able to model the complex function with minimal error. Lu plans on exploring two future paths with this research: speech recognition and predictive analysis. “We can make predictions on natural spoken language, so you don’t even have to say the full word,” explains Lu. In predictive analysis, Lu hopes to use the system to take in signals with noise, like static from far-off radio stations, and produce a cleaner stream of data. “It could also predict and generate an output signal even if the input stopped,” he says. 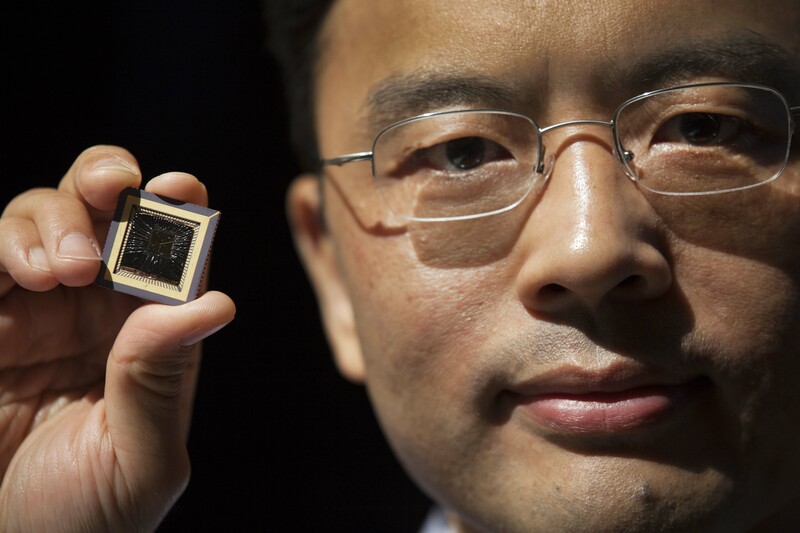 IMAGE: Wei Lu, Professor of Electrical Engineering & Computer Science at the University of Michigan holds a memristor he created. Photo: Marcin Szczepanski. 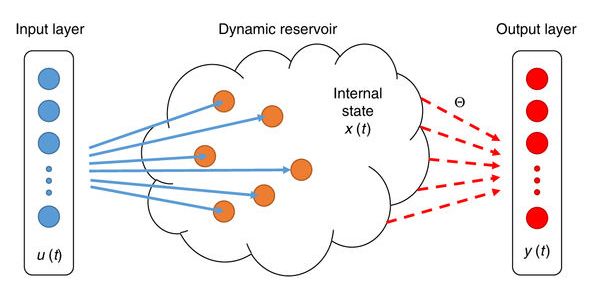 The work was published in Nature Communications in the article, “Reservoir computing using dynamic memristors for temporal information processing”, with authors Chao Du, Fuxi Cai, Mohammed Zidan, Wen Ma, Seung Hwan Lee, and Prof. Wei Lu. The research is part of a $6.9 million DARPA [US Defense Advanced Research Projects Agency] project, called “Sparse Adaptive Local Learning for Sensing and Analytics [also known as SALLSA],” that aims to build a computer chip based on self-organizing, adaptive neural networks. The memristor networks are fabricated at Michigan’s Lurie Nanofabrication Facility. Lu and his team previously used memristors in implementing “sparse coding,” which used a 32-by-32 array of memristors to efficiently analyze and recreate images. This entry was posted in electronics, light, nanotechnology, neuromorphic engineering and tagged artificial brain, artificial intelligence systems learning properties, artificial memristor synapses neural networks, Ayoub H. Jaafar, Chao Du, computing devices, DARPA, Emanuele Verrelli, Fuxi Cai, handwriting recognition, human brain, image recognition, machine learning, Mary O'Neill, memristors, Michael Berger, Mohammed A. Zidan, Neil T. Kemp, neuromorphic computing, next generation memory, optoelectronics, perform logic, predictive analysis, reservoir computing system, Reservoir computing using dynamic memristors for temporal information processing, resistive device, resistive memory, Reversible optical switching memristors with tunable STDP synaptic plasticity: a route to hierarchical control in artificial intelligent systems, Robert J. Gray, Seung Hwan Lee, Sparse Adaptive Local Learning for Sensing and Analytics (SALLSA), sparse coding, spike-timing dependent plasticity (STDP), STDP learning, Stephen. M. Kelly, store data, SyNAPSE, synaptic plasticity, traditional computers, tuneable learning, two-terminal electric elements, UK, University of Hull, University of Michigan, US Defense Advanced Research Projects Agency, voice recognition, Von Neumann architecture, Wei D. Lu, Wei Lu, Wen Ma on January 3, 2018 by Maryse de la Giroday. The US has embarked on a number of what is called “Grand Challenges.” I first came across the concept when reading about the Bill and Melinda Gates (of Microsoft fame) Foundation. I gather these challenges are intended to provide funding for research that advances bold visions. Today [July 29, 2016), Federal agencies participating in the National Nanotechnology Initiative (NNI) released a white paper (pdf) describing the collective Federal vision for the emerging and innovative solutions needed to realize the Nanotechnology-Inspired Grand Challenge for Future Computing. The grand challenge, announced on October 20, 2015, is to “create a new type of computer that can proactively interpret and learn from data, solve unfamiliar problems using what it has learned, and operate with the energy efficiency of the human brain.” The white paper describes the technical priorities shared by the agencies, highlights the challenges and opportunities associated with these priorities, and presents a guiding vision for the research and development (R&D) needed to achieve key technical goals. By coordinating and collaborating across multiple levels of government, industry, academia, and nonprofit organizations, the nanotechnology and computer science communities can look beyond the decades-old approach to computing based on the von Neumann architecture and chart a new path that will continue the rapid pace of innovation beyond the next decade. As government documents go, this is quite readable. For anyone interested in learning more about the future federal plans for computing in the US, there is a July 29, 2016 posting on the White House blog celebrating the first year of the US National Strategic Computing Initiative Strategic Plan (29 pp. PDF; awkward but that is the title). This entry was posted in electronics, nanotechnology and tagged artificial brain, artificial neural network (ANN), brain, cognitive computing, compostable or biodegradable systems (polymers, deep learning, etc. ), machinelearning, Michael Meador, Nanotechnology-Inspired Grand Challenge for Future Computing. A Federal Vision for Future Computing: A Nanotechnology-Inspired Grand Challenge (white paper), neuromorphic computing, neuromorphic engineering, neurons, NNI, paper, silicon, synapses, US BRAIN Initiative, US Department of Defense, US Department of Energy, US Intelligence Community. US, US National Institute of Standards and Technology, US National Nanotechnology Initiative, US National Science Foundation, US National Strategic Computing Initiative Strategic Plan, Von Neumann architecture on August 22, 2016 by Maryse de la Giroday. A group of scientists has created a neural network based on polymeric memristors — devices that can potentially be used to build fundamentally new computers. These developments will primarily help in creating technologies for machine vision, hearing, and other machine sensory systems, and also for intelligent control systems in various fields of applications, including autonomous robots. The authors of the new study focused on a promising area in the field of memristive neural networks – polymer-based memristors – and discovered that creating even the simplest perceptron is not that easy. In fact, it is so difficult that up until the publication of their paper in the journal Organic Electronics, there were no reports of any successful experiments (using organic materials). The experiments conducted at the Nano-, Bio-, Information and Cognitive Sciences and Technologies (NBIC) centre at the Kurchatov Institute by a joint team of Russian and Italian scientists demonstrated that it is possible to create very simple polyaniline-based neural networks. Furthermore, these networks are able to learn and perform specified logical operations. A memristor is an electric element similar to a conventional resistor. The difference between a memristor and a traditional element is that the electric resistance in a memristor is dependent on the charge passing through it, therefore it constantly changes its properties under the influence of an external signal: a memristor has a memory and at the same time is also able to change data encoded by its resistance state! In this sense, a memristor is similar to a synapse – a connection between two neurons in the brain that is able, with a high level of plasticity, to modify the efficiency of signal transmission between neurons under the influence of the transmission itself. A memristor enables scientists to build a “true” neural network, and the physical properties of memristors mean that at the very minimum they can be made as small as conventional chips. Some estimates indicate that the size of a memristor can be reduced up to ten nanometers, and the technologies used in the manufacture of the experimental prototypes could, in theory, be scaled up to the level of mass production. However, as this is “in theory”, it does not mean that chips of a fundamentally new structure with neural networks will be available on the market any time soon, even in the next five years. The plastic polyaniline was not chosen by chance. Previous studies demonstrated that it can be used to create individual memristors, so the scientists did not have to go through many different materials. Using a polyaniline solution, a glass substrate, and chromium electrodes, they created a prototype with dimensions that, at present, are much larger than those typically used in conventional microelectronics: the strip of the structure was approximately one millimeter wide (they decided to avoid miniaturization for the moment). All of the memristors were tested for their electrical characteristics: it was found that the current-voltage characteristic of the devices is in fact non-linear, which is in line with expectations. The memristors were then connected to a single neuromorphic network. A current-voltage characteristic (or IV curve) is a graph where the horizontal axis represents voltage and the vertical axis the current. In conventional resistance, the IV curve is a straight line; in strict accordance with Ohm’s Law, current is proportional to voltage. For a memristor, however, it is not just the voltage that is important, but the change in voltage: if you begin to gradually increase the voltage supplied to the memristor, it will increase the current passing through it not in a linear fashion, but with a sharp bend in the graph and at a certain point its resistance will fall sharply. Then if you begin to reduce the voltage, the memristor will remain in its conducting state for some time, after which it will change its properties rather sharply again to decrease its conductivity. Experimental samples with a voltage increase of 0.5V hardly allowed any current to pass through (around a few tenths of a microamp), but when the voltage was reduced by the same amount, the ammeter registered a figure of 5 microamps. Microamps are of course very small units, but in this case it is the contrast that is most significant: 0.1 μA to 5 μA is a difference of fifty times! This is more than enough to make a clear distinction between the two signals. After checking the basic properties of individual memristors, the physicists conducted experiments to train the neural network. The training (it is a generally accepted term and is therefore written without inverted commas) involves applying electric pulses at random to the inputs of a perceptron. If a certain combination of electric pulses is applied to the inputs of a perceptron (e.g. a logic one and a logic zero at two inputs) and the perceptron gives the wrong answer, a special correcting pulse is applied to it, and after a certain number of repetitions all the internal parameters of the device (namely memristive resistance) reconfigure themselves, i.e. they are “trained” to give the correct answer. The scientists demonstrated that after about a dozen attempts their new memristive network is capable of performing NAND logical operations, and then it is also able to learn to perform NOR operations. Since it is an operator or a conventional computer that is used to check for the correct answer, this method is called the supervised learning method. Needless to say, an elementary perceptron of macroscopic dimensions with a characteristic reaction time of tenths or hundredths of a second is not an element that is ready for commercial production. However, as the researchers themselves note, their creation was made using inexpensive materials, and the reaction time will decrease as the size decreases: the first prototype was intentionally enlarged to make the work easier; it is physically possible to manufacture more compact chips. In addition, polyaniline can be used in attempts to make a three-dimensional structure by placing the memristors on top of one another in a multi-tiered structure (e.g. in the form of random intersections of thin polymer fibers), whereas modern silicon microelectronic systems, due to a number of technological limitations, are two-dimensional. The transition to the third dimension would potentially offer many new opportunities. The common classification of computers is based either on their casing (desktop/laptop/tablet), or on the type of operating system used (Windows/MacOS/Linux). However, this is only a very simple classification from a user perspective, whereas specialists normally use an entirely different approach – an approach that is based on the principle of organizing computer operations. The computers that we are used to, whether they be tablets, desktop computers, or even on-board computers on spacecraft, are all devices with von Neumann architecture; without going into too much detail, they are devices based on independent processors, random access memory (RAM), and read only memory (ROM). The memory stores the code of a program that is to be executed. A program is a set of instructions that command certain operations to be performed with data. Data are also stored in the memory* and are retrieved from it (and also written to it) in accordance with the program; the program’s instructions are performed by the processor. There may be several processors, they can work in parallel, data can be stored in a variety of ways – but there is always a fundamental division between the processor and the memory. Even if the computer is integrated into one single chip, it will still have separate elements for processing information and separate units for storing data. At present, all modern microelectronic systems are based on this particular principle and this is partly the reason why most people are not even aware that there may be other types of computer systems – without processors and memory. *) if physically different elements are used to store data and store a program, the computer is said to be built using Harvard architecture. This method is used in certain microcontrollers, and in small specialized computing devices. The chip that controls the function of a refrigerator, lift, or car engine (in all these cases a “conventional” computer would be redundant) is a microcontroller. However, neither Harvard, nor von Neumann architectures allow the processing and storage of information to be combined into a single element of a computer system. However, such systems do exist. Furthermore, if you look at the brain itself as a computer system (this is purely hypothetical at the moment: it is not yet known whether the function of the brain is reducible to computations), then you will see that it is not at all built like a computer with von Neumann architecture. Neural networks do not have a specialized computer or separate memory cells. Information is stored and processed in each and every neuron, one element of the computer system, and the human brain has approximately 100 billion of these elements. In addition, almost all of them are able to work in parallel (simultaneously), which is why the brain is able to process information with great efficiency and at such high speed. Artificial neural networks that are currently implemented on von Neumann computers only emulate these processes: emulation, i.e. step by step imitation of functions inevitably leads to a decrease in speed and an increase in energy consumption. In many cases this is not so critical, but in certain cases it can be. Devices that do not simply imitate the function of neural networks, but are fundamentally the same could be used for a variety of tasks. Most importantly, neural networks are capable of pattern recognition; they are used as a basis for recognising handwritten text for example, or signature verification. When a certain pattern needs to be recognised and classified, such as a sound, an image, or characteristic changes on a graph, neural networks are actively used and it is in these fields where gaining an advantage in terms of speed and energy consumption is critical. In a control system for an autonomous flying robot every milliwatt-hour and every millisecond counts, just in the same way that a real-time system to process data from a collider detector cannot take too long to “think” about highlighting particle tracks that may be of interest to scientists from among a large number of other recorded events. This entry was posted in electronics, nanotechnology and tagged A.V. Emelyanov, computers, G. Baldi, Hardware elementary perceptron based on polyaniline memristive devices, Harvard architecture, Italy, M.V. Kovalchuk, memrisors, memristive neural networks, Moscow Institute of Physics and Technology (MIPT), neural plasticity, neuromorphic engineering, neurons, P.K. Kashkarov, perceptron, plastic memristors, polyaniline-based neural networks, polymeric memristors, Russia, S. Battistoni, S. Iannotta, V.A. Demin. V. V. Erokhin, Von Neumann architecture on January 27, 2016 by Maryse de la Giroday. While it continues to be a national priority to advance conventional digital computing—which has been the engine of the information technology revolution—current technology falls far short of the human brain in terms of both the brain’s sensing and problem-solving abilities and its low power consumption. Many experts predict that fundamental physical limitations will prevent transistor technology from ever matching these twin characteristics. We are therefore challenging the nanotechnology and computer science communities to look beyond the decades-old approach to computing based on the Von Neumann architecture as implemented with transistor-based processors, and chart a new path that will continue the rapid pace of innovation beyond the next decade. Many of these breakthroughs will require new kinds of nanoscale devices and materials integrated into three-dimensional systems and may take a decade or more to achieve. These nanotechnology innovations will have to be developed in close coordination with new computer architectures, and will likely be informed by our growing understanding of the brain—a remarkable, fault-tolerant system that consumes less power than an incandescent light bulb. This is the first time I’ve come across anything that publicly links the BRAIN initiative to computing, artificial intelligence, and artificial brains. (For my own sake, I make an arbitrary distinction between algorithms [artificial intelligence] and devices that simulate neural plasticity [artificial brains]. )The emphasis in the past has always been on new strategies for dealing with Parkinson’s and other neurological diseases and conditions. This entry was posted in electronics, energy, human enhancement, medicine, nanotechnology, neuromorphic engineering, science and tagged analog systems, artificial brain, artificial intelligence, BRAIN Initiative, cognitive science, human brain, Lloyd Whitman, Lynn Bergeson, magneto-electronic sytems, National Nanotechnology Initiative, National Strategic Computing Initiative (NSCI), neuroscience, OSTP, Randy Bryant, Tom Kalil, US Office of Science and Technology Policy (OSTP), US White House, Von Neumann architecture on October 27, 2015 by Maryse de la Giroday.